It's beginning to get warmer and there will be more yard sales, and sometimes drums appear out in people's front yards. I always brake for a yard sale to make sure there's not a sweet vintage drum for ten dollars in amongst all the junk. Check out the local pawn shops from time to time also. Tell the owner you would like a notification if any drums hit the floor. I have found some great snares and sets in pawn shops. Get your friends to be on the lookout for drums as they travel. I get a photo of a drum on my phone from friends quite often. Most of the drums they find are the newer variety, but I always tell them thanks for looking out for me. My friend Bill Pace puts an ad in the classified section in local towns. He says, "Old Drummer looking for Old Drums." It works for him, and he gets calls about drums families have in the attic. 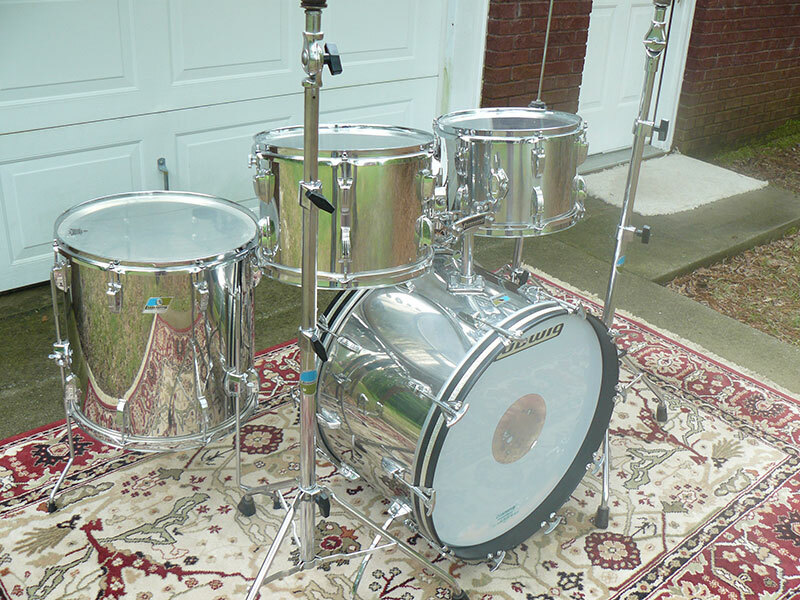 eBay and Craigslist aren't the only source of great vintage drums. Get out there and look for them, because if you don't, that brass Supraphonic will remain in that closet for many more years. I have a real great set from my collection to show you this month. It’s a 1970s Ludwig Stainless Steel Hollywood Set. 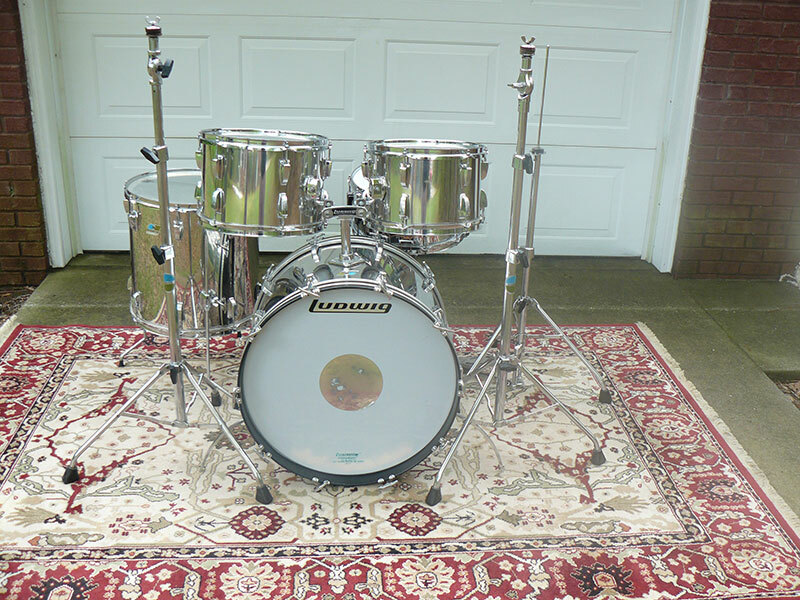 Ludwig introduced its line of stainless steel drums in the mid 1970s. These drums look so great and have a loud and powerful sound. They are also quite heavy. We all know John Bonham played a big Ludwig Stainless Steel kit soon after they came out with Led Zeppelin. The downfall of these drums was the cost to produce them. The same could be said about the Vistalite drums also. By the early 1980s the stainless steel shell drums were discontinued. They have been reintroduced in recent years for a limited run. The cost of the new stainless drums is very high. There are quite a few of these original wonderful sets out there for collecting and also playing. These drums from my collection are standard sizes: bass drum 22"X14, floor tom 16"X16", mounted toms are 13"X9", and 12"X8". The snare drum on display with the set is a 70s 14"X6.5" Supraphonic. I have a couple of Stainless steel drum set stories I thought I would tell you. My good friend Lige Moore bought a great stainless steel set and loaned them to another friend. Our mutual friend's home burned with the stainless set inside. The Supraphonic snare drum was saved, but the rest of the kit burned. The shells came through the fire, but they looked pretty bad. Lige had a second 22" bass drum that I still have. I have his bass drum and snare drum in my stuff. Lige also gave me the shells that were burned, so I buffed them and sold them on E-Bay. They had no shine but they were still pretty cool. 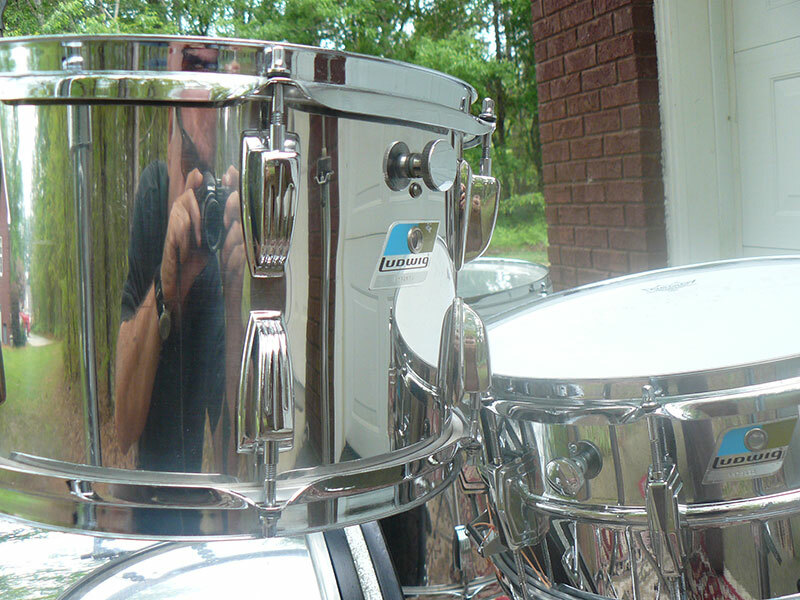 Another stainless steel story - I was doing some work for a man and the topic of drums came up. He told me he played and had a drum set in his house. I told him I also played and would really like to see his drums. I figured he would have an import set, but boy was I surprised to walk in to his drum room and find a flawless Stainless Steel set with all original hardware and Zildjian cymbals. I just never expected that set to be there in his house. He had bought them new in 1977 and he had never played them outside of his house. They were dusty and needed heads and a good cleaning to make them look like they had just come out of the music store. I asked him If he would like to sell them, but he said he didn't. I asked him about trading him a new set of Pearl or Tama drums for them and he said he might do that, but as of yet he hasn't. I'm not telling any of you where they are. I'm hoping he will let me replace them one day. My set is nice, but his is much nicer. 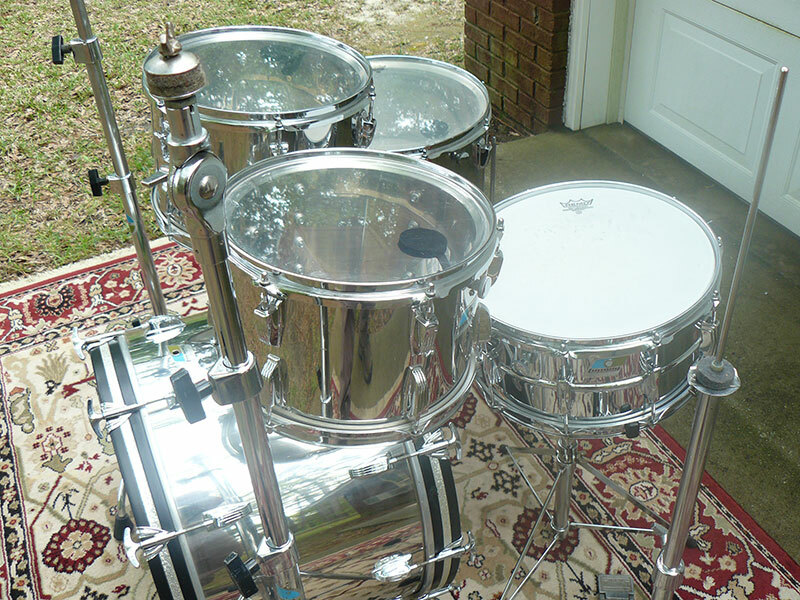 Make a comment if you have or play a Stainless steel drum set. I would like to get your feedback.